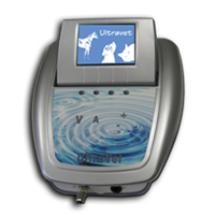 Ultravet is an ultrasonic device, studied, developed, manufactured and assembled within our factory in the Haute-Loire. Like any wave propagated through the tissues, ultrasonic waves undergo phenomena of reflection, refraction, diffusion, absorption by the various tissues through which they pass. At the high acoustic impedance, the US = & gt; Almost total reflection and warm-up at the interface with the tissues + reflected waves return towards the head at US = & gt; 1) Significant risk of burns - 2) Risk of damage to the head at US = & gt; Necessity of use of a conductive gel. The bristles form insulating air layers. 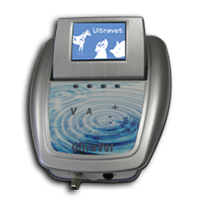 = & Gt; areas of ultrasonic reflection and overheating = & gt; risk of burns - Loss of treatment effectiveness = & gt; Necessity to mow skin and degreasing with alcohol. The flow of sound waves is made to traverse, on the one hand, several interfaces between the tissues and, on the other hand, the tissues themselves, which may be of heterogeneous structure. At each interface, the flux undergoes reflection and diffraction phenomena which gradually attenuate its power (hence the efficiency) along its path to the target tissue => To minimize these phenomena, it is important that the flux is closest to the normal to these different planes. 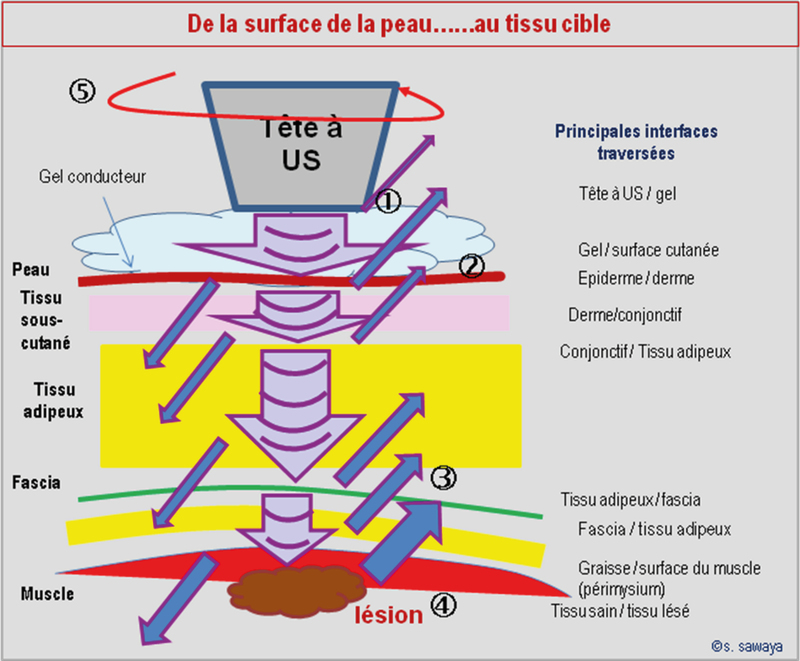 The US head must 1) have maximum contact with the skin (through the coupling gel 2) be held as perpendicularly as possible to the surfaces to be treated. Depending on the depth of the target tissue on the one hand, and due to the attenuation of the power of the US with the different layers traversed on the other hand, it is important to select the most suitable frequency for an optimal treatment = & gt; Up to 2 cm depth: use high frequencies (3 MHz) - Between 2 and 5 cm: use low frequencies (1 Mhz). Due to the phenomena of reflections accompanied by heat release, in order to avoid the risk of burns (in depth, at the interfaces) and in surface area (overheating of the head) = & gt; it is important to keep the head at US in motion, especially when using continuous flow, but also in pulsed flow up to 50%. ∎ Equine access and carnivorous access depending on the pathologies. ∎ Predefined programs for each pathology (sprain, tendonitis, osteoarthritis ...). ∎ Special treatments (point of acupuncture, tigger point ...). ∎ Adjustable parameters for each treatment (frequency, power, duration of treatment ...). ∎ A memory to create your own treatment. ∎ Visual information of optimal head contact. ∎ Product developed in collaboration with Dr Serge SAWAYA. => The main US indications concern the subacute and chronic diseases: 72 hours after trauma especially when treatments with US in continuous or pulsed mode at 80% and 50%. However, it may also be possible to benefit from the antalgic and trophic properties of the highly pulsed US (20%) during acute phase affections. It is then recommended to associate with cold therapy (ice massages or cold packs followed by 20% US). ∎ Post-traumatic disorders: inflammatory edema, hematomas, postoperative pain. ∎ Contractures and muscle pain. ∎ Fibrous sequelae and scarring of joint, tendon or muscle trauma. ∎ Osteoarthritis, stiffness, joint ankylosis: Warm-up with US in continuous or pulsed mode at 50% followed by mobilizations and long and sustained stretching. ∎ Osteoarthritis before massages and passive mobilizations. ∎ Low-intensity Ultrasound (£ 0.5 W / cm²) enhances cartilage and bone healing during delays in osteosynthesis. ∎ Low intensity US also favors nerve healing (axonomettsis, nerve surgery). ∎ Skin disorders: surgical scars (if less than 3 months old): defibrosing power. Bed sores, skin ulcers and sluggish wounds, wounds and cutaneous grafts: promote the healing process.